The queen stitches on the bodice are done. I don't really like how they look, and they were really hard to do. There are some mistakes in them, but I'm not redoing it. On to the rest of her tunic and skirt. I found a wonerful fabric store at the place I'm visiting and these great ribbons and buttons were dying to be bought. I have plans. My two favorites are the daisies on black and the ships. I've never seen a ribbon like the ships one. The buttons in close up. I really like the gold-flecked ones. I made significant progress on the first house this week. I'm sorry my blogging's gone a bit spotty. I promise that after Friday, it'll be back to normal. Been off on vacation and will be back to whatever normal is next week. As you know, I've not been stitching much this past week and a bit. Can you see the progress on here? I promise there is some. I'm going to be making really slow progress probably until the end of the year, since it's just about time to begin my Christmas rush. I'm over halfway done with my little heart. I'm really loving how this overdye is working up. i finished the circles I was working on last week and added more circles inside. One more set of stuff inside- smyrna crosses, then these circles will be done! I got more of the Stars done this week. I've decided the stars are going to bered, white, blue, white red across the top. Also got the line of yellow just before them done. Easy, but it's hard to find time these days. I've actually not stitched at all two days in the past week. This is unheard-of from me. This week I added the last of some of the light blues on the white stripes and a bit more on the sashing coming off her waist. Still slow progress, and sometimes hard to see, but it -is- progress nonetheless. I'm up to Q now. Got quite a bit more done this week, and it's getting close to being done. I'm taking it on the trip I start tomorrow. Maybe I'll be able to finish it there. It's -so- close and my husband is almost done with the frame. At the beginning of the month, I got Candi H's block for the seamy side round robin. This is how it looked when i got it. The seams are huge, wonderful fantasies. I found it hard to work around the seams because they overlapped so much else, but I got it done. There are still two more people to work on this block, so I left room for them, too. Here's the block after I finished. Here is a close up of one of the seams. I couched down a green velvet ribbon with French knots and chevron stitches. This is what I did with the other seam. 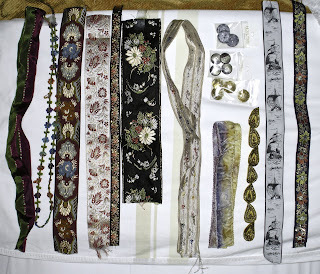 I made scrolls, added a butterfly, an covered the whole piece of fabric in French knots. A kind of restful place to give the eyes a break. And finally I put her initials in a small area that needed to be filled. I hope she likes it. So Bibendum not only has a finger, he's got half a head now. It's working up fairly quickly, thankfully. I like the way he looks. I finally finished the cross stitches for parts two and three. Yay! Now to start on the specialty stitches, and there are a lot of them. I don't think it'll take me as long with them as it did for the cross stitches, though. I still really love the way this fabric makes the design pop. This week I caught a big mistake while working on part 14. I'm going to have to frog four squares on the right border and redo them. They're off by two stitches. It's the only real thing that's given me problems with this mystery thing - getting off by a stitch or two because I don't have any context in the chart to put it in its place. At last it's not an even bigger mistake. I'm working on lots of little fiddly bits in this part. The vine-type thing has knots and diamonds in it. Those I'm doing in a separate color. They're the most tedious part of the band, though. This project I started over the summer with my face to face chapter. I put it aside at the time because my rotation was full (isn't it always?). I had the slot back when I finished my temari, so I put this in there. I figure it's a small project and better to be done than sit in a corner neglected. So, this week I finished the lettering and started the yellow under it. The string art stitches in this section remind me of a waterfall. The instructions for putting the stitches next to each other could have been clearer, but I figured it out. I think. Anyway,this part is done and it's time to start another. It's coming together - slowly as usual, but progress is being made. I got her face done this week and started filling out her tunic. This part is going pretty quickly. The face doesn't really have any contrast between the two colors - one overdyed and one plain - used. Maybe it'll show up more when she's outlined. Now you can see more of the beginning of the building. While I love the blue I finished, I'm so happy to go on to something new. This is, so far, going pretty well, too, and has a lot of variety. Can you see the progress here from last week? I can! I finished some red and worked some on the skirt, in the lighter colors. I also added a bit more to the ribbon trailing down darkly. Yes, another crazy quilt round robin. This is from the My Favorite Things round robin, and the second block I've worked on. The owner lives in India and she chose an Indian village as her theme. Here is the block before I did any work. This is how it looks now that I've done my part. I tried to fill in a lot of space because it looked bare to me for after someone else had worked on it. I added a motif across the top, an elephant in the central panel, and two seam treatments. Here is the top in detail. I used Kreinik Braid, Sheep's Silk, and Watercolours. This time the stitching's going much faster on the heart. I've got the whole bottom done and am beginning to put in the lettering. I really like the colors on this and it looks rather modern-Christmas without being garish to me. Last week the picture was taken while I was in the middle of this in my rotation. That's why it's here again - I finished off what I did. The M is almost halfway done, and I'll be working on it again tomorrow. I'm almost done, finally, with the cross stitching on parts two and three. It's taken me long enough! The group is closed and I'm still on part three. I am sooooo slow. I've even been working on it pretty steadily all this time. Oh well, it'll keep me going for years, right? I finished the big flower in the middle of the band this week. It's pretty much the whole length of the band. There are some vines and smaller flowers to each side that I've started. Blackwork takes a lot longer than people think. After all, it's only double running stitch, right? This is the longest I have ever kept up with a stitchalong. With thirteen of twenty parts done, I may even keep with it the whole way. I still like my color choices and think it'll turn out well when done. Got part fourteen this week and have started stitching it. This week I started her face. At first, I took her suggestion and did cross stitches over one. They looked too bulky, though, so I ripped them out and did continental stitch. I think it looks a lot better. The over one part went much more quickly than I thought it would. Only one more color and her head is done but for backstitching. I thought I was a bit closer to being done with the flag than I was last week. I got quite a bit more white on it and some more of the darker reds. Still quite a bit more to go, but at least every week I see progress. Last year I did a Joyeux Noel freebie from Carinne's site. My husband really liked it, so when we were looking for a not too big project for a colleague of his, i went back to it and am making another one. This time I'm doing it on white hardanger fabric using Vikki Clayton's Dragon Hoard color in a premium size. I really like the way the color is turning out, and it looks Christmasy to me. This one is going a lot faster than the one I did last year, too.